Hida Viloria | Born Both listed as one of the Culture Essentials for March! 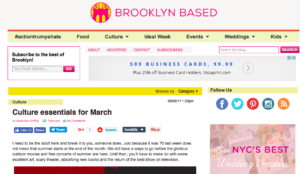 I’m a native New Yorker, and my memoir begins in Brooklyn, so I couldn’t be more pleased and honored to be listed as one of the “Culture Essentials for March“, by the Brooklyn-based arts and culture blog Brooklyn Based. Big thanks to the article’s author Annalise Griffin, and everyone at Brooklyn Based for such a beautiful review! ← Born Both Makes Bustle’s 20 Best Nonfiction Books of March List!